You should all know by now how much I love my mandolin. There’s something so satisfactory about slicing vegetables and fruits into paper thin ribbons and stacking them together in a beautiful pattern as a gratin, pie or tart. I feel like it’s the best way to cook vegetables and fruits, especially if you’re adverse to mushy baked textures like me. The integrity of the ingredients still hold up, while still having plenty of flavor – and crispy edges. It’s all about the crispy edges, right? 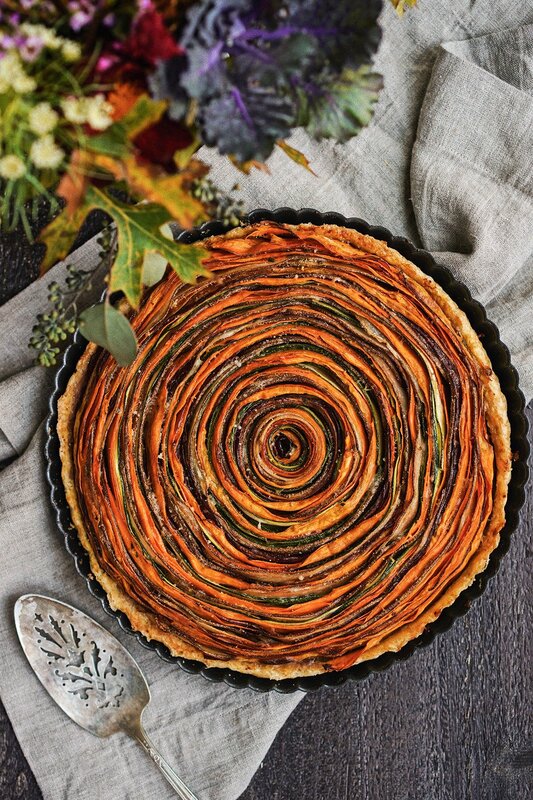 I love this vegetable spiral tart, especially as a dish to serve during the holidays. It’ll, no doubt, be a crowd pleaser. The process is definitely a bit time consuming but once you get the hang of it, it’s actually really fun to make. Feel free to switch out the vegetables depending on your taste and season! 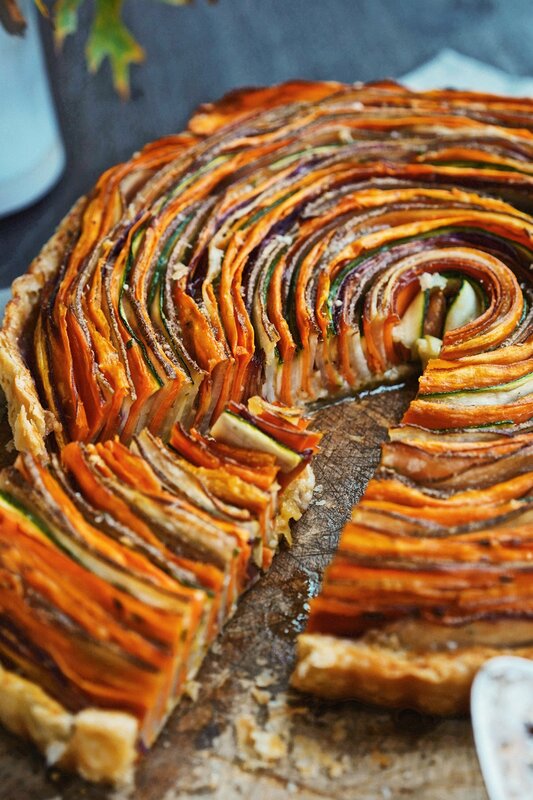 This impressive and beautiful spiral tart can be customized with your favorite seasonal vegetables. Sprinkle the cold water on top and pulse again just until the dough comes together into a ball, but it won’t be completely smooth yet. You should still see small bits of butter. Place a piece of plastic wrap on your working surface and turn the dough out onto it. Fold the plastic over and press the dough into a 1-inch thick disc. Make sure it is wrapped completely and refrigerate the disc of dough for 2 hours (or overnight). When chilled, place the disk of dough on a lightly floured surface and roll out until 1/8 inch thick, periodically lifting and rotating to make sure it isn’t sticking to your surface (dust your surface as needed). Carefully transfer the dough to your tart pan, easing it in without stretching the sides, and gently press into place. Trim with a sharp knife even with the rim of your pan. Chill until firm to touch, 30 min – 1 hour. At this point it can be frozen (well- wrapped) for 2 weeks if needed. No thawing necessary if you freeze it! Line the tart shell with parchment paper and fill with pie weights (or dried beans). To partially bake, bake until the surface looks dry and pale, about 25 minutes. Remove from the oven and remove the paper and weights. Return to the oven a bake for 5 minutes longer. To make the dough in a food processor, put your flour and salt in the food processor and sprinkle on your cold butter pieces. Cover and pulse several times until the butter is cut into pea size pieces. As your tart shell is being partially baked, prep the vegetables by shaving them into thin ribbons. A mandolin would work but I find a vegetable peeler even easier and faster - and you get even finer shavings, which cuts down on the cooking time of the tart. For the potatoes and sweet potatoes, I recommend cutting them in quarters, length-wise. 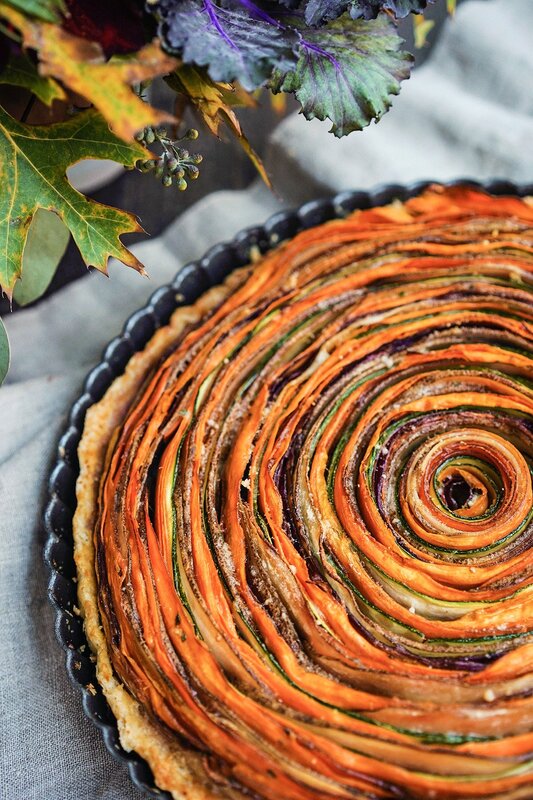 All the vegetables should roughly be around the same width so when they're laid upright in the tart, you can visibly see all the pretty, colorful layers. In a large mixing bowl, combine cream, parmesan, salt, pepper, nutmeg and chili pepper. Whisk until combined. Toss the vegetable ribbons into the cream mixture until they're all coated. Take a ribbon (I like to use zucchini here) since it's so flexible. Roll it into a tight spiral and place it on the center of the partially baked tart shell. Take another vegetable and wrap it around the center spiral. Continue working outwards, alternating vegetables. The cream actually makes the vegetables stick to each other so it's not as hard as it looks! Once you've reached the edge of the tart shell, brush the top of the tart with olive oil and sprinkle with a good sprinkling of finely grated parmesan cheese. Bake at 350 °F for 50 to 60 minutes, until vegetables are soft and cooked through. Cool in tart pan for 10 minutes, then slice and serve. Baking time will greatly depend on how thin your vegetables are. Using a good quality, sharp Y-peeler is preferred over a mandolin, and much safer and faster to use. If you use a mandolin, I recommend covering the tart with foil to bake for 20 minutes and then removing the foil and bake uncovered for another 45 minutes. In the spring and summer, you can replace the root vegetables with different varieties of squash and eggplant. I would just decrease the baking time. This looks stunning!!! I’m not sure if I can make it beautiful like this though.